Flint, Michigan - It was a rout for the Rangers in Flint on Wednesday night as the Boys in Blue won 7-2. Greg Meireles led the way for Kitchener with one goal and three assists, while Nick McHugh scored two goals and picked up one helper. Another notable highlight was Isaac Langdon’s first goal of the season. Kitchener, ON. : The Erie Otters (10-13-1-0) visited The Aud on Friday November 23rd in a tilt against the Rangers (12-12-2-0) who were playing their third game in four nights. 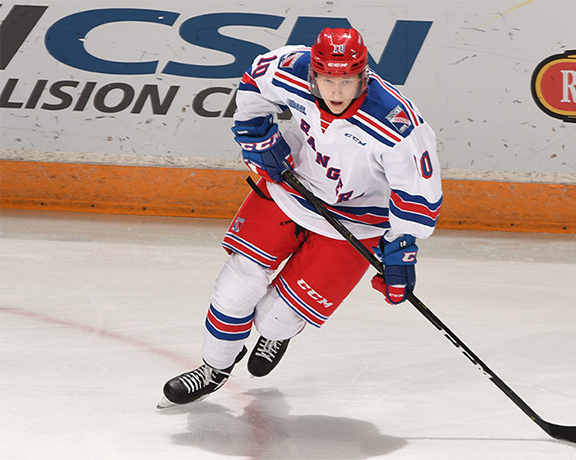 The Rangers next home game on Friday, November 30 at 7:30 pm versus the Niagara IceDogs. The next road game for Kitchener is on Sunday, December 2 at 2:00 pm vs the Guelph Storm.